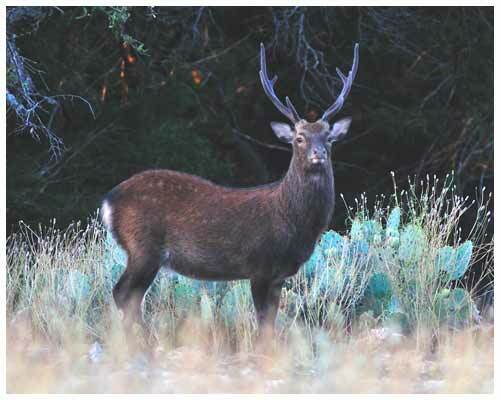 Escondido Ranch in Texas is home to a substantial number of Sika Deer that provide a hunting challenge year round. These medium sized deer range from 25 inches at the shoulder to almost 40 inches with bucks larger and heavier than does. The color of Sika deer varies from a reddish chestnut brown of the does through to a dark brown to almost black coloration of the bucks. A white caudal or rump patch is visible in most species and they often have a very dark dorsal stripe running down the back. Males tend to develop a heavy mane as they mature, similar to that of the Wapiti and Elk. The head is more refined that that of the elk but is definitely heavier and more square shaped than an antelope or deer. Bucks and does will have a large weight variation that can be between 100 pounds to over 200 pounds in mature Sika bucks. The antlers of the species are a great addition to any trophy wall. They are similar to the Elk antlers with four to six tines per side. 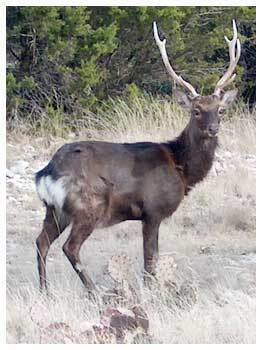 In most cases mature bucks will have 8 tines, four on each side, however in managed game ranches such as the Escondido Ranch in the Texas Hill Country, gold medal trophy bucks are often available. The antlers typically measure between 28 and 48 cm with three to four tines. The Sika Deer is closely related to the Wapiti and the Red deer and are able to interbreed. In their native areas of Russia, Siberia, Manchuria and Southern China they live mostly in the dense, thick deciduous and coniferous forests, however in warmer climates they adapt to thickets and brushy areas very well. This very popular deer has been introduced in many countries around the world, originally as ranched or managed species , but has since reverted to the wild and can now be found in national parks and game reserves. Herds of wild Sika deer are common in England, Australia, Denmark, Morocco and even in Maryland in the United States. There are several different subspecies within the Sika Deer Group with the largest being from Manchurian species known as Dybowski's Sika and the smallest the Japanese Sika deer species. The males are territorial and keep a herd of females with them during the mating season. The territory is marked by a series of ruts that the buck digs with his hooves and then marks with urine. Often these territories are fairly large, up to 2 hectares in size. Sika bucks will battle fiercely to protect their herd and their territory. Their rut on Escondido Ranch is mid September to mid October. They tend to prefer grasses, leaves and shoots of tender, woody brushes that are located on the edges of thickets and forested areas. They will also browse on young oak trees, hackberry and greenbriar species of plants. The Sika deer is most active in the early morning and early evening hours and after dark, they tend to be more in the open during those time frames in the day.